The Baychimo was a was a steel-hulled 1,322 ton cargo steamer built in 1911. She started her life under another name under the Flag of Germany. She was passed to Great Britain as part of the WWI war reparations. In 1921 she was acquired by the Hudson Bay trading company. Her purpose was to deliver food and supplies to the Eskimo communities in exchange for pelts. She did her duties well and uneventfully for several years. On October 3rd, 1931 all that started to change. She became briefly trapped in pack ice. After a few days she was freed, but again became stuck on the 8th of the same month. The Company airlifted her crew out, leaving 15 members behind to care for the ship from a secure camp nearby. All was going well until the 24th of November. 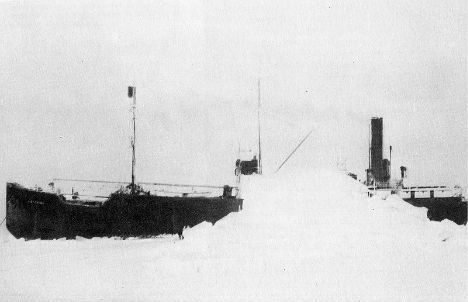 A raging blizzard struck the area, and amazingly enough the ship was gone after the weather cleared. The captain concluded the ship had broken up and sank during the storm, while stuck in solid pack ice. ice. 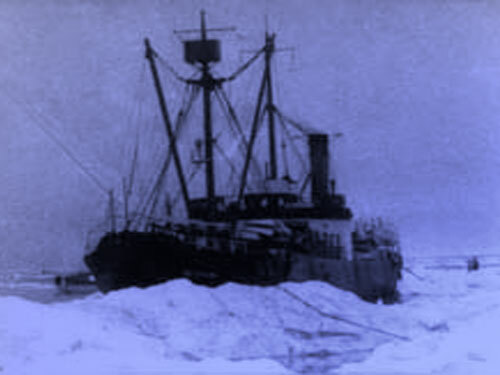 The crew tracked her down, and found her badly damaged and held in the ice‘s grip. They off loaded all the cargo and said goodbye, as they figured she would soon be claimed by the relentless ice. The Baychimo did not sink. Instead she began a long, well documented odyssey. She was frequently seen floating around aimlessly by local Eskimos and passing vessels. The Baychimo was boarded several times but the weather always seemed to take a turn for the worse, thwarting any salvage attempts. * Several months after she was abandoned she was spotted intact again about 300 miles to the east. A group of Inuit from port Barrow boarded her. * In March 1932 Leslie Melvin spotted her floating near the shore while traveling to Nome via dog-sled team. Later that summer some locals boarded her and salvaged some of her furnishings. saw her again, moving off in the direction of Barrow. * March of 1933 a group of Eskimos found and boarded her. Shortly after they were onboard a freak storm came up and trapped them for 10 days. * August 1933 the Hudson Bay Co was informed she was still afloat. However she was too far out to sea and disappeared before she could be salvaged. * July 1934, she was boarded by a group of explorers on a schooner. She was unable to be salvaged at the time. * September 1935, she was seen off the Alaskan coast. Captain Parker of the Northland unexpectedly came upon the phantom ship. They had last seen her about three year prior with the ship Trader. He hoped to get alongside, but before he could do so the vessel was enshrouded in fog. When the fog eventually lifted the Baychimo had once again vanished. * November 1939, She was boarded by Captain Hugh Polson, wishing to salvage her, but the creeping ice floes intervened and the captain had to abandon her. * After 1939, she was seen floating alone and crewless numerous times, but always eluded capture. * March 1962, she was seen sailing along the Beaufort Sea coast by a group of Eskimos kayaking. 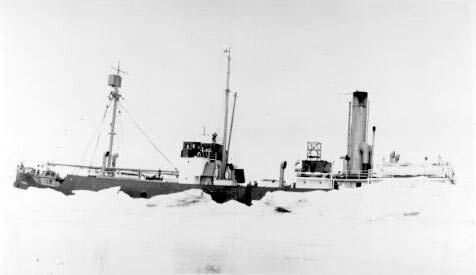 * 1969 she was spotted by the SS Manhattan in pack ice of the Beaufort Sea between Point Barrow and Icy Cape in the Chukchi Sea off the northwestern Alaskan coast. This was the last recording sighting of the Baychimo. In 2006, the Alaskan government began work on a project to locate and solve the mystery of the Baychimo. If she has sank, there way be plans to raise her and restore the “Ghost ship of the Artic”. As of yet, she has not been found, but at any point she could again come out of the fog.